There are about 400 varieties of sweet potatoes. The skin and flesh may be almost white, cream, yellow, orange, pink, or deep purple. This variety of purple-fleshed sweet potato ('uala in Hawaiian), is only grown here on Moloka'i by the Decoite Family of L & R Farms. They have been producing these sweet purple tubulars since 1978 and now they can be found in the best restaurants in Hawaii. These potatoes not only taste sweeter, but have 3 times the antioxidant properties of the orange-fleshed sweet potato. Preheat oven to 375˚F. Prepare three foil lined roasting trays. Lay pork rib sections on the first tray. Mix ribs with salt, pepper, garlic powder, and chopped rosemary. Put ribs into the oven and cook about 1 1/4 hours, or until brown and crispy. Meanwhile on the second tray, mix potatoes with oil, honey, cinnamon, salt and pepper, then lay them out in a single layer, and set aside. Snap the dry stem ends off of each asparagus and place them on the third tray. mix with olive oil, sprinkle with salt and pepper, and toss, then lay flat on tray. After the ribs have roasted for 45 minutes, place the potatoes in the oven and roast for about 30 to 40 minutes, or until the potatoes are tender. 15 minutes before the ribs and potatoes are cooked, put the asparagus in the oven and cook until asparagus is limp but still crisp. Sprinkle asparagus with lemon juice and transfer everything to a serving platter or individual plates. Makes 4 servings. Sweet potato leaves are widely consumed in West Africa, Malaysia, and the Philippines, the heart-shaped leaves are just becoming popular here in the United States. It is a wonderful green, similar to spinach, but crisper with a slight bitter taste. Sweet potato leaves are chock-full of antioxidants that could help to prevent heart disease, diabetes, infection and some types of cancer. This is a simple salad recipe that is used by my Filipino friends here on Moloka'i. Separate leaves from the thick stems, keeping only the tender part of the stem. Wash them thoroughly with clean water. Fill a large pot with water and salt, bring to a full boil. Add leaves and blanch for 10 seconds, don't over cook. Set aside. Mix all the other ingredients together and pour over the sweet potato greens. Lightly toss with a fork to distribute the flavors and serve hot with fish and rice. Makes 2 servings. Note: Sweet potato leaves make a great addition to soups. Cover and let sit at room temperature for 25 minutes, or refrigerate for 1 hour to let flavors combine. Serve over fresh watercress and garnish with taro or tortilla chips. Makes 6-8 servings. 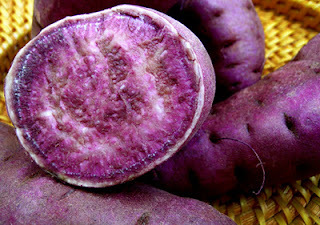 Note: Regular sweet potatoes can be substituted for Moloka'i purple sweet potatoes. Scoop out the inside of the baked purple sweet potato and puree it. In a large bowl slightly beat an egg. Whisk in the whole milk. Add the sweet potato puree and the melted butter, whisk until smooth. Add the salt, vanilla, nutmeg, brown sugar, cinnamon and baking powder. Whisk until fully incorporated. Add the flour and mix until smooth. Add about 1 tablespoon of canola oil to griddle or frying pan and heat over medium-high heat. Using a 1/4 cup scoop, scoop batter onto the hot griddle. Cook until the bottom side is golden, and the top is covered in small bubbles... if the bottom gets too dark turn down the heat slightly. Flip over and cook until the bottom is golden. Flip the pancakes only once... otherwise they get tough. Serve immediately with lots of butter and maple syrup. Makes 8 to 10 small pancakes.